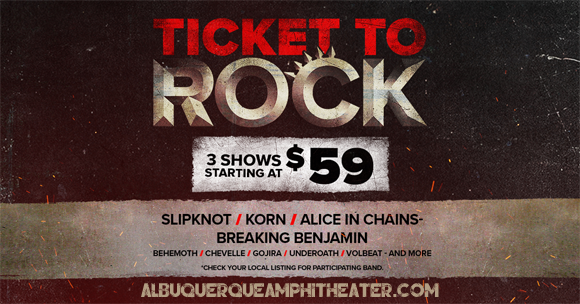 The behemoth that is Ticket To Rock returns once more, giving rock and metal fans the chance to see Slayer, Slipknot, Volbeat, Gojira & Behemoth, Korn & Alice In Chains and Breaking Benjamin & Three Days Grace, all for the cost of one ticket! All these incredible bands will be performing at Isleta Amphitheater throughout the summer and you can rock out with them! Make sure you grab your ticket by Thursday 2nd May 2019!